In the past 10 years, canine cancer research has led to new tests to diagnose cancer early, new drugs to treat cancer and new treatment options and protocols to help fight and cure cancer in dogs. What will the next 10 years bring? With your help, anything is possible! Georgia on her last birthday, September 2005. Please help us as we fight to find a cure for canine cancer. By donating just $10 or more, you will be supporting important research to identify, treat and CURE cancer in our beloved canine companions. Georgia was a beautiful English Bulldog who officially came into our lives in October 2000, as a 4-week old furry bundle of energy and love. We had planned for her for months, as excited as any new parents could be, and when we met her, we instantly fell in love and knew that she was meant to be our little girl. When we brought Georgia home at 8 weeks old, she immediately became the center of our universe and the light of our lives, and taught us the depths of the human-animal bond. Not a day went by that we didn’t think how lucky we were to have met this special angel, who never ceased to make us smile and laugh and who made every day a little brighter. Like thousands of other pet parents each year, we were absolutely devastated when Georgia was diagnosed with lymphoma at only 4 years old. It had never occurred to us that despite all of our efforts to do everything right to make sure she had a long, healthy life, our dog could get CANCER! For 13 months, she bravely fought this terrible disease, going through two rounds of chemotherapy and endless vet visits. But she never let cancer affect her beautiful, loving spirit or enthusiasm for life, and remained our happy, sweet Georgia through it all. We will be forever grateful to have had this extra time with her, and thank every researcher, veterinarian and vet tech who played a role in helping Georgia receive the life-extending cancer care that she received. Without it, we would have had only 4-6 weeks after diagnosis with our little girl. When Georgia left us on April 24, 2006, she was only 5 1/2 years old. It was the end of life as we knew it, as we had lost a part of our hearts forever when she left us on angel wings to go to the Rainbow Bridge. But the lessons learned from her were many, and the love she brought into our lives is immeasurable. And Georgia left behind an amazing legacy that continues to this day.In 2007, Georgia’s Legacy was founded as an online resource to honor Georgia’s life and spirit by helping other families whose lives have been affected by canine cancer, a disease that will strike one in three dogs. The mission of Georgia’s Legacy is to provide information and resource referral to others whose four-legged family members have been diagnosed with cancer. But most of all, Georgia’s Legacy was created to provide hope and emotional support to those in the fight. On September 12, 2010, Georgia would have been turning 10 years old. She SHOULD be turning 10 years old. Cancer strikes too many of our beloved canine family members each year, and not enough of them are able to beat this ruthless disease. 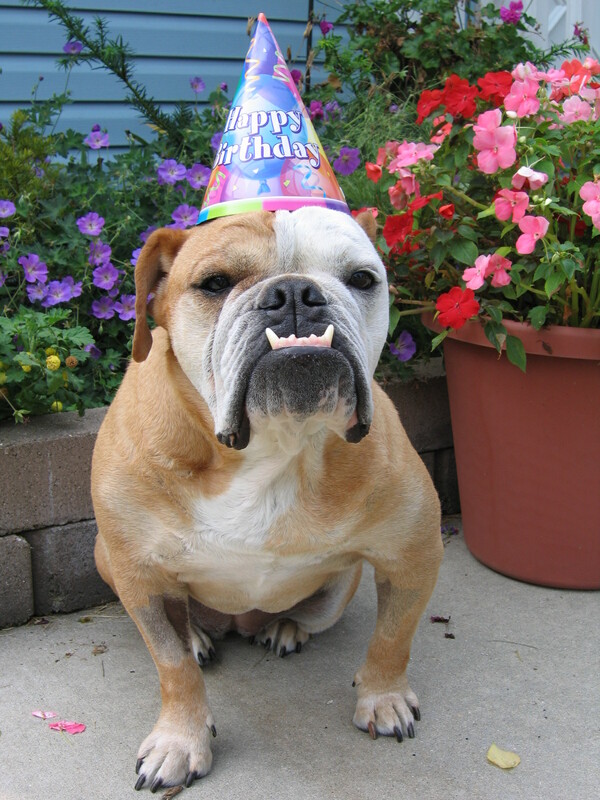 Too many birthdays have never been celebrated because of canine cancer. Let’s put an end to that. Please join me in this special birthday campaign to raise money to fund groundbreaking research to prevent and treat canine cancer. So much progress has been made in recent years to fight canine cancer, but we still have so much work to do. Please donate today to help find a cure. In honor of Georgia’s 10th birthday and all of the other birthdays that have never been celebrated, please donate today. Our goal is to inspire at least 300 people to donate just $10 to fight canine cancer and to celebrate the lives of the dogs they love. And, if you donate on this site, you are invited to submit a photo of your dog(s) with a tribute/comment of up to 10 words to birthdays@fightcaninecancer.com. Your dog’s photo will then be added to the Georgia’s Legacy website, on our special Birthday Party page. Together, we can fight canine cancer, and eventually win this battle once and for all! You can also help the cause by visiting out CafePress store and purchasing canine cancer apparel and awareness items. This entry was posted in Events, News and tagged canine cancer, canine cancer campaign, canine cancer cure, canine cancer research, dog cancer, Georgia's Legacy, morris animal foundation. Bookmark the permalink.